DHARAMSHALA, Oct. 1: On the occasion of ‘World’s River Day’, Students for a Free Tibet activists took off from India’s highest paragliding spot in Billing, Bir on Sunday to highlight the plight of Tibet’s rivers that are endangered due to China’s exploitative damming and diversion pursuits. 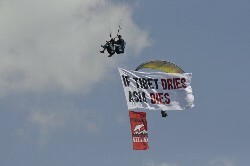 "Tibet Dries, Asia Dies," reads a giant banner that activists held midair as they hovered over Kangra district. “Home to the largest store of fresh water outside the Arctic and Antarctic, Tibet is on the frontline of global climate change and under serious threat from China’s failed policies. Tibet’s environment, particularly Tibet’s rivers, is a geostrategic concern for South and Southeast Asia,” SFT said. A string of campaigns by the activist group on the same agenda in the last few years implore attention and awareness on Tibet’s rivers that feed many downstream nations in Asia including China, India, Vietnam, Cambodia, Laos, Thailand, Burma, Bangladesh, Nepal, Bhutan, and Pakistan. Last year, SFT flagged off an initiative from Leh in the remote Tibet-India border urging downstream nations that lie in the flow path of the Brahmaputra river to push for binding treaty with China as part of their campaign, ‘Tibet’s River Asia’s Lifeline’ which highlights all the major rivers that originate from Tibet and sustain majority of Asian countries. Similarly, in 2016, the group visited Guwahati in Assam to highlight the unending torrent of hydropower and mining projects built on the Brahmaputra river by China in occupied Tibet resulting in damages from the receding water level of the rivers to the decreasing fish population in the water affecting livelihood of the fishermen in downstream regions. Experts say that Tibet’s permafrost reserves are giving in to global warming and China’s reckless exploitation of rivers, causing irreversible danger to Tibet.